Every week on Scriptnotes, Craig and I do our One Cool Things, through which we each recommend something worth checking out. Then on Twitter, I’ll link to things I think my followers may find interesting or useful. But there’s a problem: neither venue is particularly well-suited to the task of collecting and presenting the cool stuff that’s out there. If you don’t listen to the podcast, you won’t hear it. If you don’t follow me on Twitter — or if the algorithm doesn’t show you the tweet — you won’t see it. And I’m always hesitant to link to too much, because Twitter is overwhelming enough as it is. 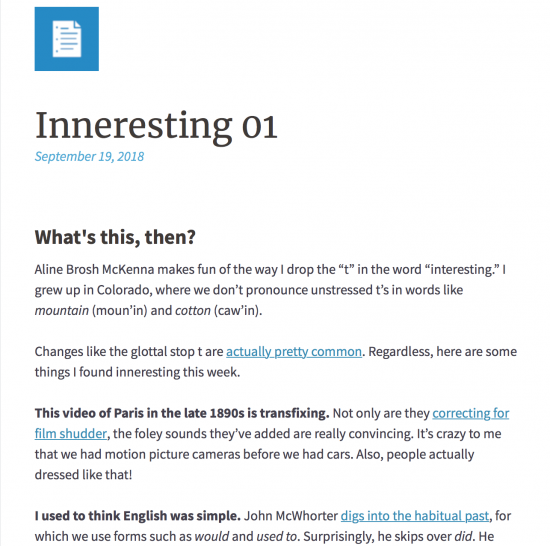 So I’m trying something new: a little newsletter called Inneresting. It’s a weekly-ish roundup of stuff I’ve found interesting. There are some bits about writing and language, but the unifying theme is just that I’ve found these things worth pointing out. Isn’t that what this blog is for? you ask. Well, sort of. Each newsletter could easily be a post on the site. But in order to read it, you’d have to think, huh I wonder if there’s a new post? and then click over to johnaugust.com.1 For a while, I ran a side blog called Off-Topic that was a similar idea, but how would a reader know when to check it? Inneresting simply shows up in your email inbox. Read it whenever. I’ve turned off the creepy analytics. There are no trackers or data collectors other than occasional Amazon affiliate links. Basically, I know if you’ve subscribed and if you’re still opening the email. If you’re not, I’ll stop sending it. Check out the first issue, and subscribe if you like it.